Meizu had earlier launched the MX4 Pro, the bigger variant for MX4, but for the MX5 the company hasn’t announced the MX5 Pro. Instead of launching the Pro variant of MX5, it decided to stop that series and went for a new sub-brand called Pro and launched the first smartphone Meizu Pro 5 in September 2015. In less than 3 months, now the company is getting ready to launch the successor for Pro 5. The device is named as Meizu Pro 5 Mini and comes with few upgraded specifications. It sports smaller 4.7-inch Full HD display compared to the 5.7-inch display of Pro 5. Under the hood is the Helio X20 deca-core processor which isn’t yet finished the production. Apart from this, there aren’t much information regarding the specifications of the device. As per the leaked image, the Pro 5 Mini comes in 32GB and 64GB storage variants same as its predecessor. The 32GB variant will be priced at 1,999 Yuan (approx $315 / Rs. 20,700) and the 64GB variant at 2,499 Yuan (approx $394 / Rs. 25,800). On the other hand, the Meizu Pro 5 is priced at 2,799 Yuan for 32GB variant and 3,099 Yuan for the 364GB variant. It comes powered by powerful Exynos 7420 octa-core processor and 3GB/4GB of RAM. The device runs on Android 5.1 Lollipop with Flyme 5 OS on top of it. It has a 21.1MP rear camera with dual tone LED flash and a 5MP front-facing camera that can capture decent selfies. It also includes a fingerprint sensor embedded into the oval shaped physical home button. The device has a 3,050mAh battery with mTouch 2.0 technology for faster charging speeds. Review: Meizu MX5, the 2015 Flagship? 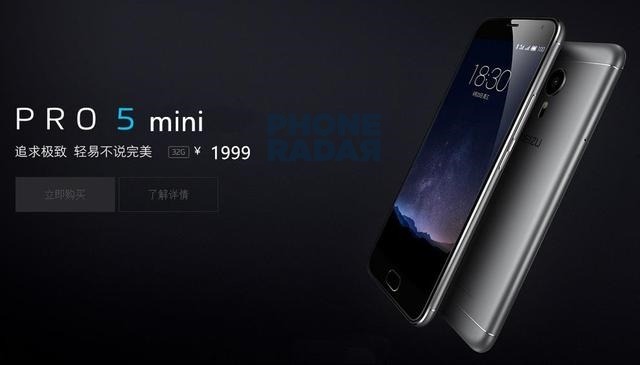 Talking about the Meizu Pro 5 Mini, there are no details mentioned by the company but we expect the device to be launched by the end of next month. Stay tuned for more information regarding the device in the coming days.